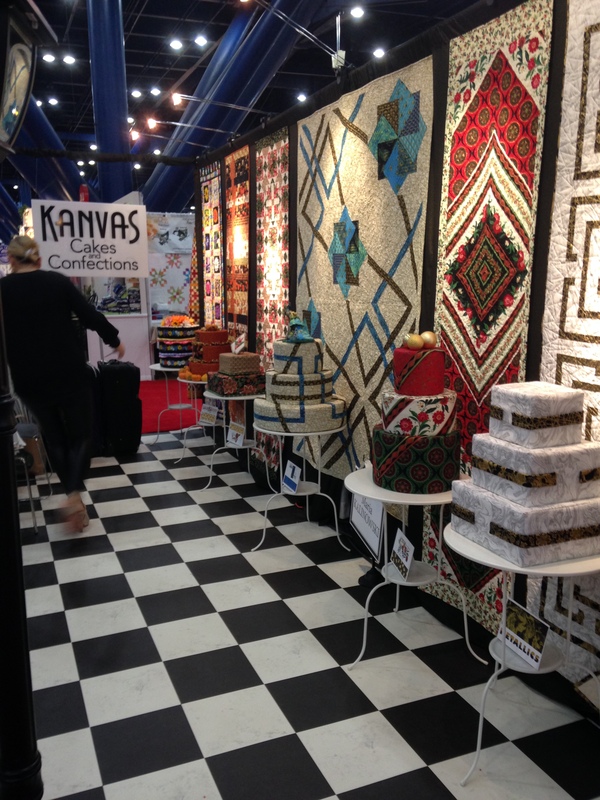 According to Quilts, Inc.com Quilts eInsider, this year’s Market in Houston drew 2,634 registered attendees, with 1,614 of those people also enrolling for classes and/or events. 1,062 people enrolled for Schoolhouse Series, and 1,169 for Sample Spree. 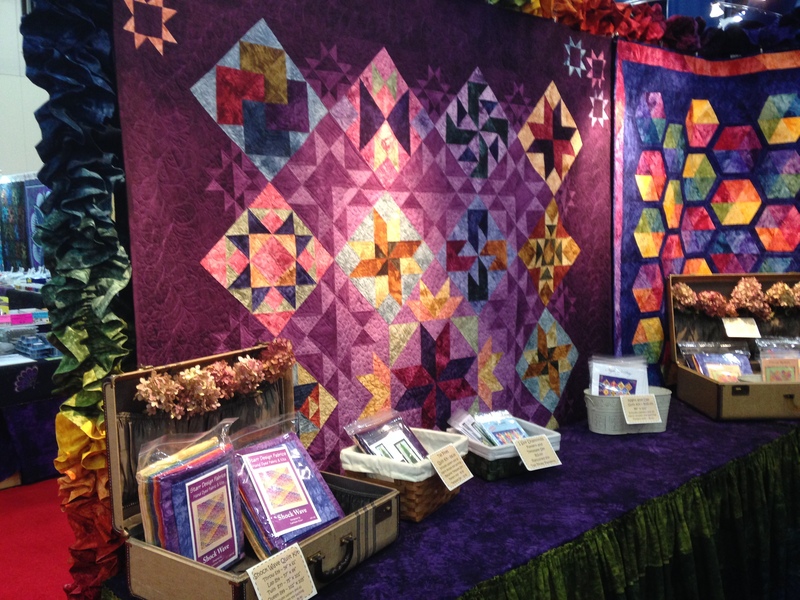 But the real news about quilt market is on the vendor floor! 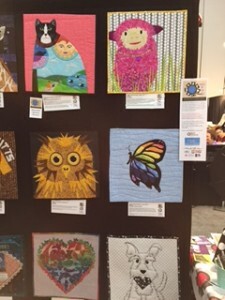 As always Fall Quilt Market thrills us with new ideas and products to rock the quilt world. This market was no different. 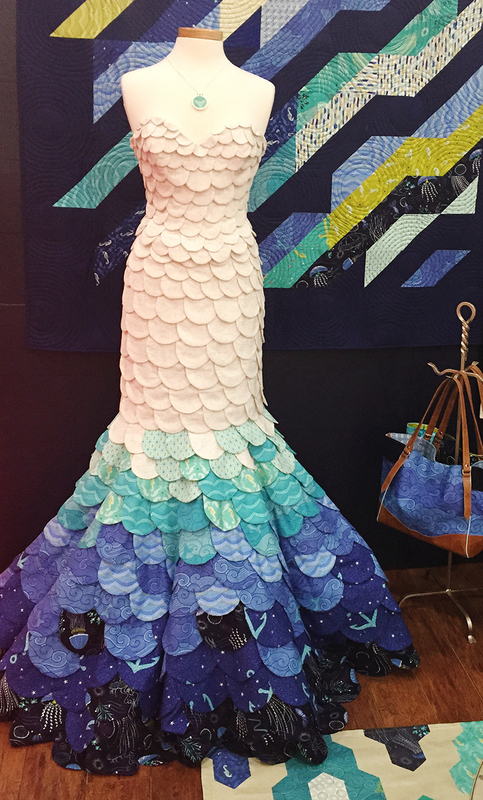 As I wandered around market talking to vendors, taking pictures, and viewing amazing quilt exhibits I noted a few trends I think you will be seeing next year in your local quilt store. Small woodland animals are still in abundance! Owls and foxes are still very popular, but add other little critters like raccoons, squirrels, and not so small critters: elephants, deer and bears. 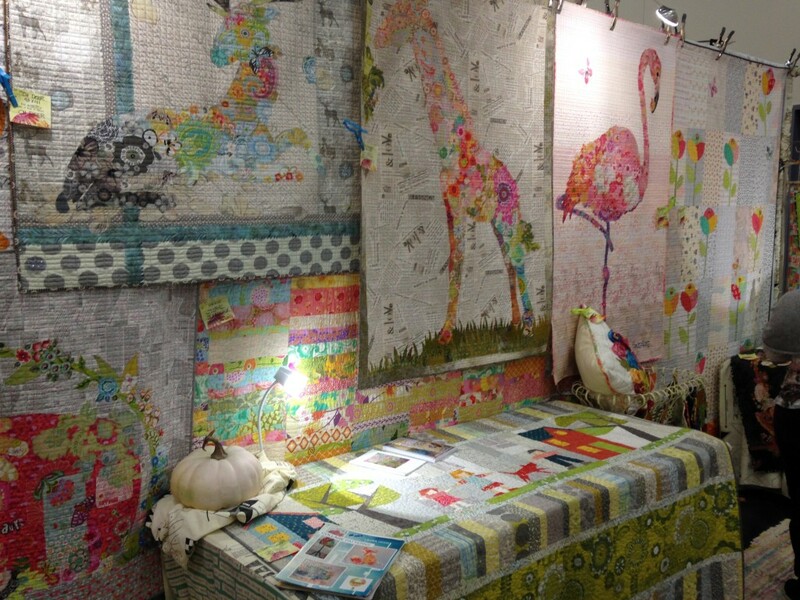 Laura Heine’s Collage Patterns were amazing, including the bear (above) and my personal favorite: the flamingo. These patterns are going to be a big hit! They were flying out of her booth. Another perennial favorite, the butterfly, was popular at market. 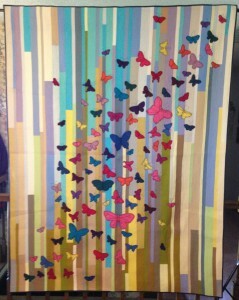 This stunner by designer Linda Frost was prominent in Fabri-Quilt’s booth. 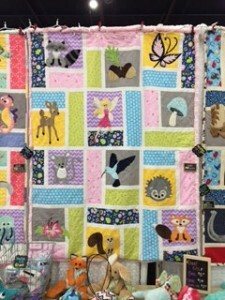 This Forest Fairy & Friends quilt by McKay Manor Musers combined small critters, butterflies, fairies and flowers. And the cute bright colors were also everywhere. I couldn’t resist this cat, sheep and owl. And check out the cute puppy and colorful butterfly. And that heart is adorable! And did I mention hearts? 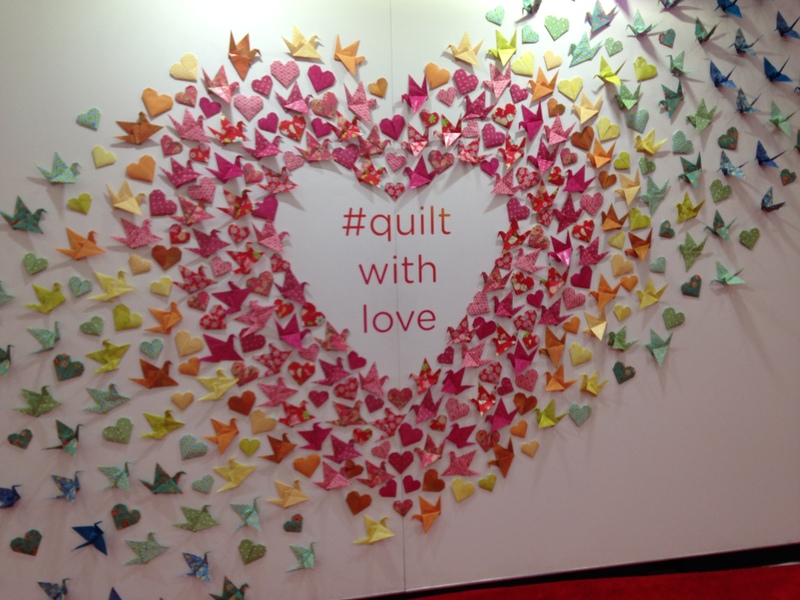 These paper folded birds and hearts were an amazing display in RJR fabrics booth. 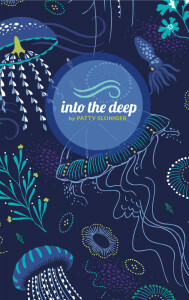 Into the Deep fabric line by Patty Sloninger was showcased by this over the top amazing mermaid dress! Whew! 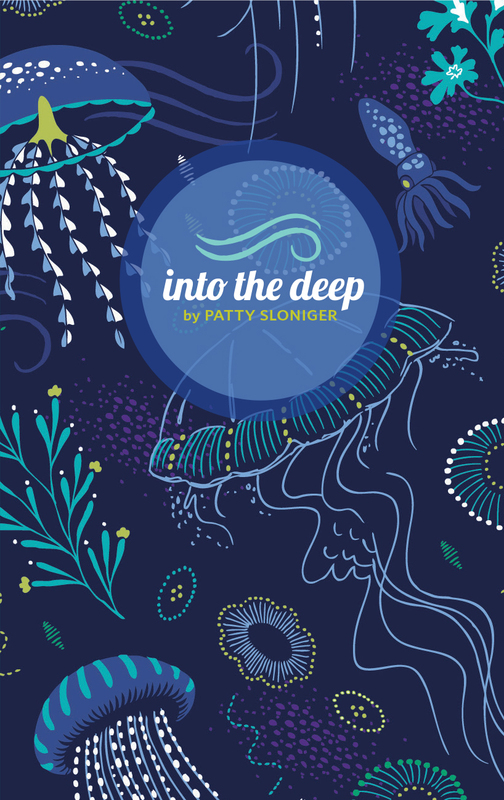 Can’t you picture that at the “Under the Sea” prom? Another critter to watch for this year is the swan. Quilts, Inc. insist this is a new and coming trend. These two fabric samples were posted on their blog. I especially like the little legs on the swans from Cloud9 Fabrics. 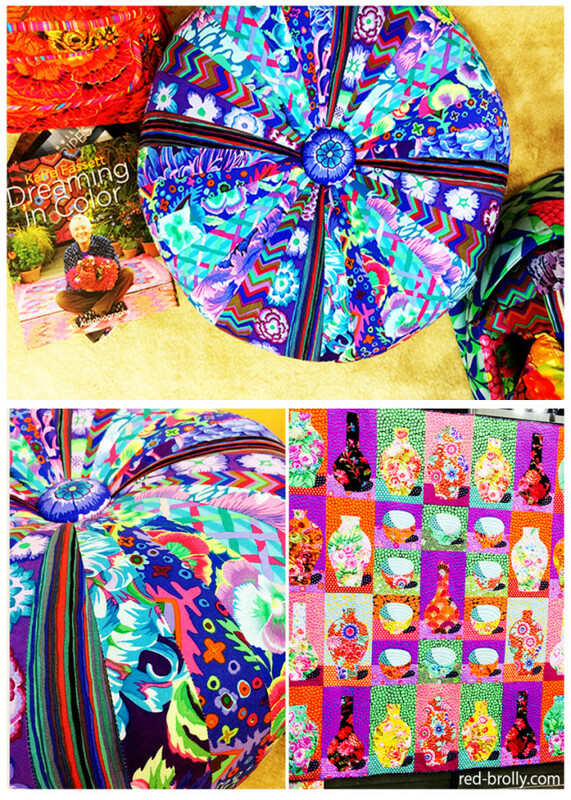 There was no shortage of bright colors in both solids and prints. Some other trends I noticed. . . wool was everywhere! Lots of primitives, as you would expect. LOTS of primitive designs and quilts in cotton and wool. But also wool in bright colors and mixed with cottons, trims, buttons, and oodles of bling! BTW, bling seemed to be slowing down a bit but if you stayed for Festival, bling was everywhere. It may not be new but it is still way popular. Reproductions were still in evidence. Moda had a new line of 30’s Playtime favorites and Paintbrush Studio features an impressive new line of Civil War shirtings by Barb Eikmeier along with a block of the month that is gorgeous. Red Crinoline Quilts featured lots of patterns for CW repros, and there were plenty of other vendors showing gorgeous fabrics and patterns featuring these unstoppable repros. 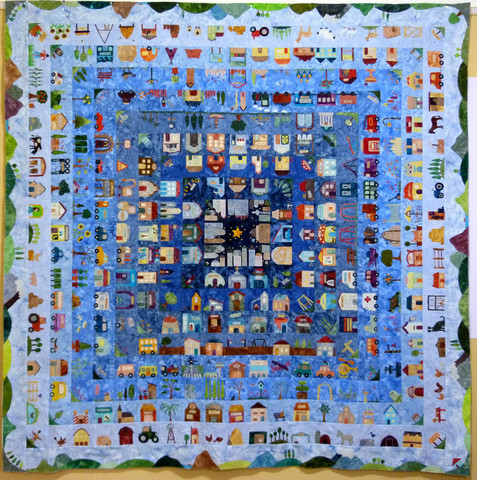 Hoffman batiks and Susan Claire Mayfield (The Gourmet Quilter) teamed up to offer Susan Claire’s amazing Block of the Day Town and Country Quilt. Kits will be available from Hoffman and from your favorite retailer. Get the patterns from Susan Claire’s website: The Gourmet Quilter.com. One last trend I should mention. Modern quilts are still very popular but I was surprised by the number of traditional fabrics and patterns being featured. 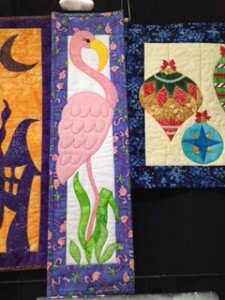 Modern and art quilts dominated the quilt exhibition, but the vendors of fabric and patterns were selling traditional fabrics and patterns, with a big dose of whimsical thrown in for flavor. And what’s not to love about these cakes featuring these quilt fabrics. Very clever! Hexagons and diamonds were still popular, but less so than at last fall’s market. Most of the store owners and buyers I spoke to were looking for pieced patterns, saying applique didn’t sell as well as traditional pieced designs. Small projects and projects featuring pre-cut were still very popular with buyers. And the truism never fails: Samples sell! 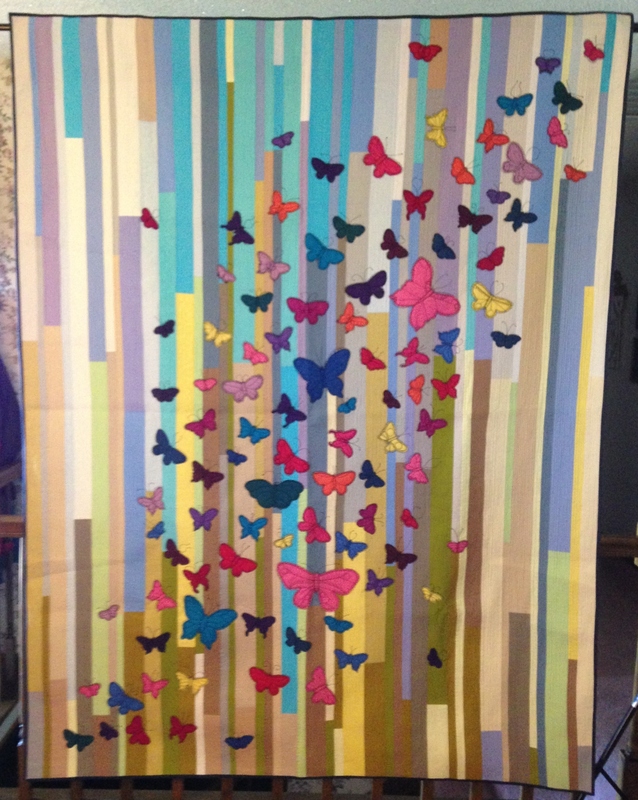 This entry was posted in Quilt Market, Trends, Uncategorized. Bookmark the permalink. 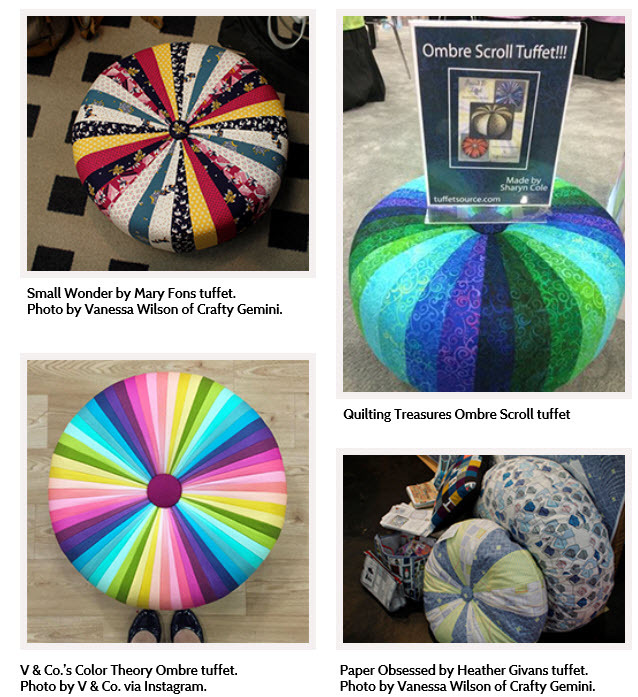 Thank you for this informative as well as beautiful blog regarding Fall Quilt Market 2015! 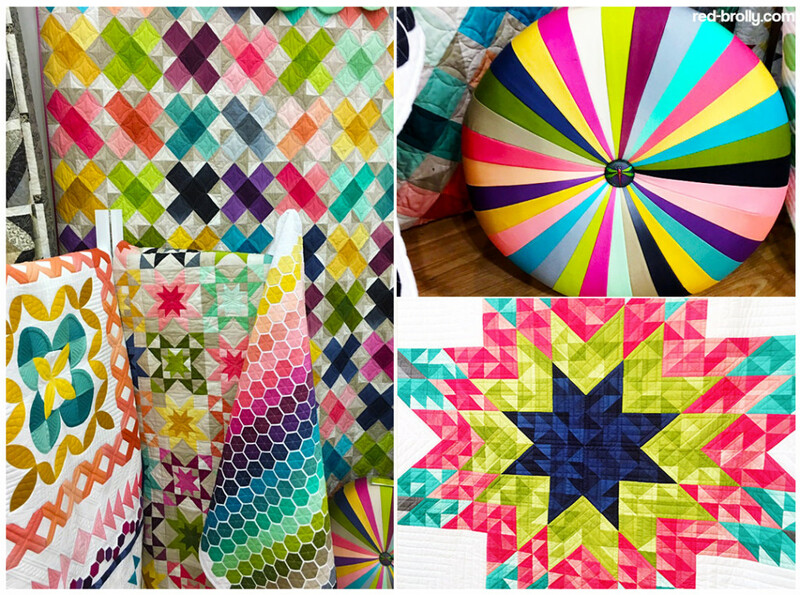 Great information, awesome photos and really helpful thoughts on trends! 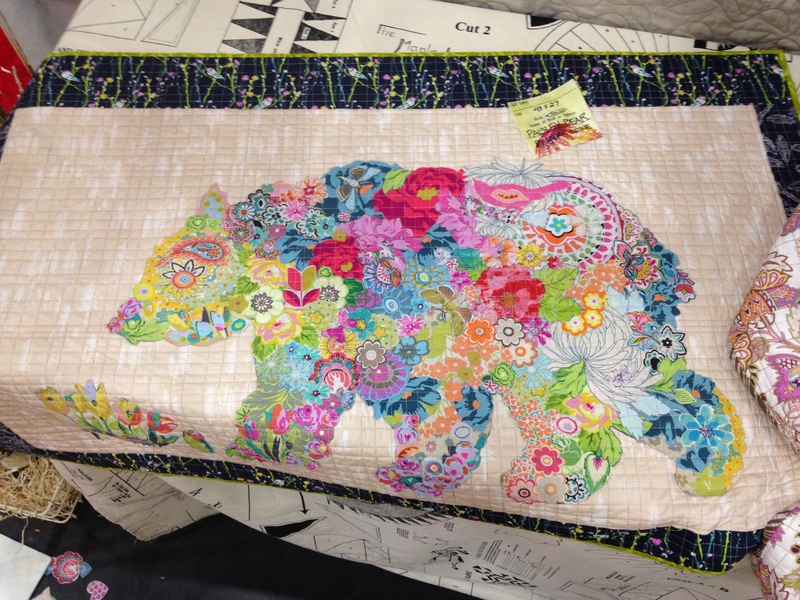 How wonderful to see the photos from Quilt Market and read all your valuable information! Thank you so very much for sharing!